(above) ON HER: Claire Pettibone’s delicate gold lace “Asscher” gown features a scalloped neckline and beaded tulle overskirt, $6,450, at the Claire Pettibone flagship boutique in Los Angeles. Add sparkle with Jennifer Behr’s “Australis Halo” gold-tone crystal headband, $495, online at Net-A-Porter. (above) ON HIM: The slim-fit Friar Tux Allure suit in slate blue features premium wool blend pants, white laydown-collar dress shirt and blue checkered tie, $154.95 rental (includes coat and vest), all from Friar Tux Shop. (above) Make a fashion statement in Demetrios’ “Kristoff” tuxedo in black with a notch lapel and slim-fit trousers, $164.95 rental, from Friar Tux Shop. 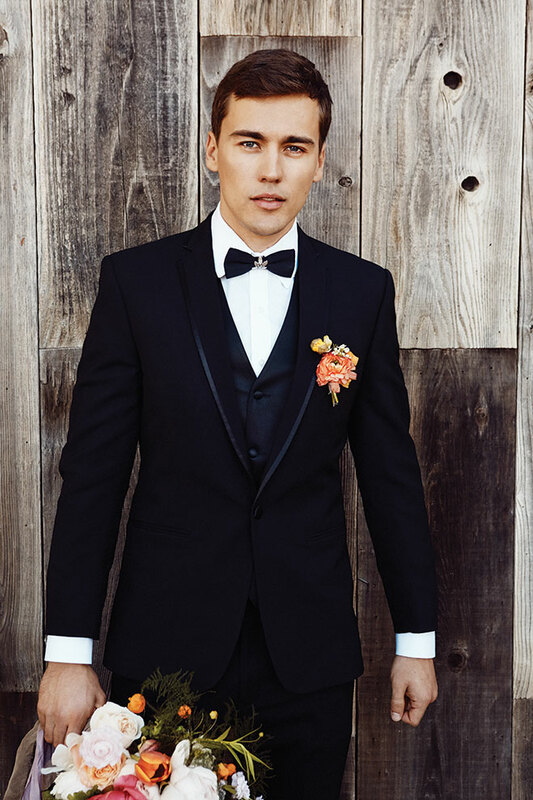 Add a stylish touch with a black silk bow tie featuring a gilded platinum vintage lace leaf, $130, online at Trace Henningsen Bridal, and a ranuncula boutonniere, $20, by Davia Lee Weddings & Events in Santa Ynez. ON HER: Made for twirling, Los Angeles–based designer Christy Dawn’s “Athena” wrap dress features a four-tiered skirt and a low-plunging neckline, $1,800, from Christy Dawn in Venice. Add a bit of sparkle with Trace Henningsen Bridal’s ivory silk sash boasting handmade vintage lace gilded in platinum, $225, and oval Elle earrings in chalcedony, $55, from Kendra Scott Boutique in Newport Beach, and Bella Belle’s crystal and pearl embellished “Hera” sandals, $160, online at Bella Belle Shoes. ON HIM: The slim-fit “Valencia” suit in gray is the perfect dancing attire paired with a white dress shirt and pink and navy-dotted tie, $134.95 rental (includes coat and vest), all from Friar Tux. ON HER: Make a statement in Galia Lahav’s ivory gown featuring vintage crocheted lace and stretch silk satin with a dramatic cathedral train and plunging back. Chic pockets adorn the front of this curve-hugging gown, $5,300, from Galia Lahav flagship store in Los Angeles. Finish the look with the handcrafted “Artemis Ivy” crown gilded in 23K gold, $575, online at Trace Henningsen Bridal, and dainty, handmade cubic zirconia earrings, $60, from BHLDN in Beverly Hills and online. ON HIM: Friar Tux’s “Valencia” suit in gray. Twirl the night away in Hayley Paige’s “Kennedy” gown, featuring an ivory beaded silk crop top with cap sleeves and bateau neckline, and tiered chiffon A-line skirt accented with a charmeuse band. Price upon request, at JLM Couture Flagship Boutique in Beverly Hills. Sweep back tendrils with the “Adeline” silver-tone Swarovski crystal headband, $625, online at Jennifer Behr. Kendra Scott’s mixed metal stacked bangles add a stylish flair, $150. Pure romance, Jinza Couture Bridal’s silk crepe and French guipure lace “Alexa” gown features a fit-and-flare cut with an illusion neckline with a V neckline, and a deep V in the back, $6,000, from Jinza Couture in Los Angeles. Bring the bling with Coast Diamond’s 1-carat diamond ring set in white gold, $8,500, from B. Anthony Jewelers in San Luis Obispo; Kendra Scott’s “Fran” gold earrings in iridescent druzy, $175; and a crystal, freshwater pearl and glass beaded bracelet arranged in beautiful blooms, $60, from BHLDN. ON HER: Vintage beauty comes alive in Lazaro’s ivory Chantilly lace, long-sleeved gown with bateau neckline and deep V back finished with a silk satin ribbon tied at the natural waist. The fit-to-flare skirt features lace godet panels and a delicate chapel-length train, Price on request, JLM Couture Boutique. Sparkle and shine in Sarah Janks’ “Frederique” silk chiffon gown featuring hand-beading and pin tuck details, $6,450, at Lovely Bride in West Hollywood, And Something Blue in San Francisco and The Dress Theory in San Diego. Add a pop of glitter with the floral Eloise ring, featuring cubic zirconia set in rhodium-plated brass, $89, online at Mindy Weiss Jewelry, and BHLDN’s delicate crystal earrings. 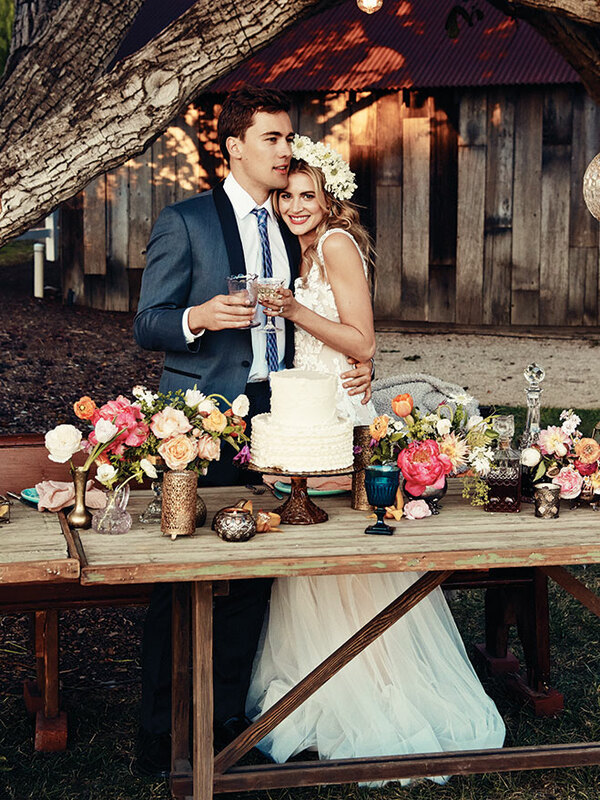 ON HER: Perfect for a garden wedding, the ethereal “Genevieve” dress by Sarah Janks features a laser-cut V neckline with a flowing tulle skirt, $3,745, at The Dress Theory, And Something Blue and Lovely Bride. Toby Pomeroy’s 1.9 carat diamond ring, $35,000, with matching wedding band in white gold, $2,300, both at B. Anthony Jewelers. ON HIM: Michael Kors’ “Destiny” tuxedo with a black shawl lapel jacket with a blue and purple checkered silk tie, $189.95 rental both from Friar Tux.